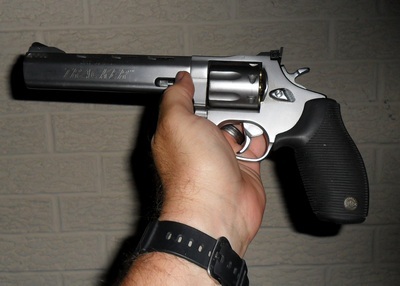 When considering a handgun for the job, you just can't hardly go wrong with the .357 magnum for home defense. Now, I know a tactical shotgun loaded with 00 buckshot will do wonders to stop a home invasion, but this is about a handgun for the use. For a handgun, if I only had one for this purpose, it would be a .357 magnum revolver. I get a lot of questions about handguns for home defense. If somebody is not asking about a specific gun, but asking for general advice on what to get, this is what I suggest. While the shotgun has it's place, handguns are more concealable and can be placed in strategic locations throughout a house that long guns just can't fit in. I have quite a few handguns, and since I review them, even the great ones eventually get sold. But some are kept longer than others and I always have one of several kinds of guns. One is the .357 magnum. The one I currently keep in a strategically selected location in my house is the good looking Taurus 627 .357 magnum, seven shot revolver. Mine has a 6" ported, vented barrel, and "Ribber' grips that fit anybody's hands in our house. The .357 is one of the most versatile guns ever, shooting .38 special, .38 special +p, or .357 magnum loads. That means it can be loaded for any shooter to handle. And the modern seven shot revolver gives plenty of firepower to use in an emergency. Our Taurus revolver is loaded with seven rounds of Winchester .38 special +p semi-jacketed hollow points. My wife and daughter need to be able to access, aim and shoot and control it if they have to ever use it in an emergency situation. Both of them practice with my guns and are familiar with the revolver. 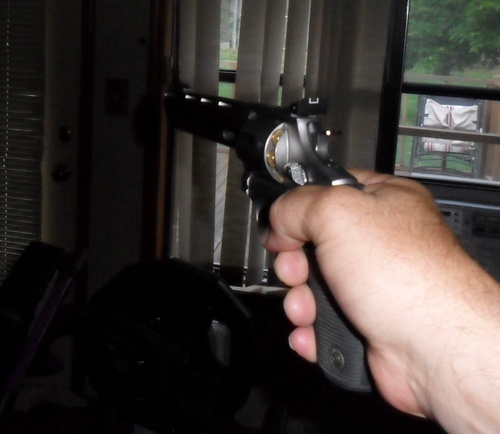 Most all full size revolvers have adjustable sights enabling you to fine tune the aiming capability of the gun. With the long barrel makes it easy to point and shoot confidently. While the loaded full size .357 magnum is a bit heavy, it is easy enough for my 16 year old daughter to grip, aim, and fire seven times without much fatigue. You may not like the idea of a teenage girl having access to a .357 magnum revolver, and I don't recommend anybody just indiscriminately allowing it. But she has proven herself on the range and in other places with excellent safe gun handling skills. She has no interest in "playing" with guns and has gained our trust to the point that we feel that it is advantageous to allow her access to the gun. In case of an emergency, the more people in the house that can safely and effectively access firearms, the better. In the middle of the night, the feel of the big handgun is reassuring. We know that if anybody breaking in to do harm to our family makes it in, they'll not likely make it back out. Will other guns work well for home defense? Sure. But for multiple members of the family to access, this gun requires a minimum of training to learn to use. And the simplicity, dependability, and fire power, make the .357 magnum revolver for home defense, the best overall choice.